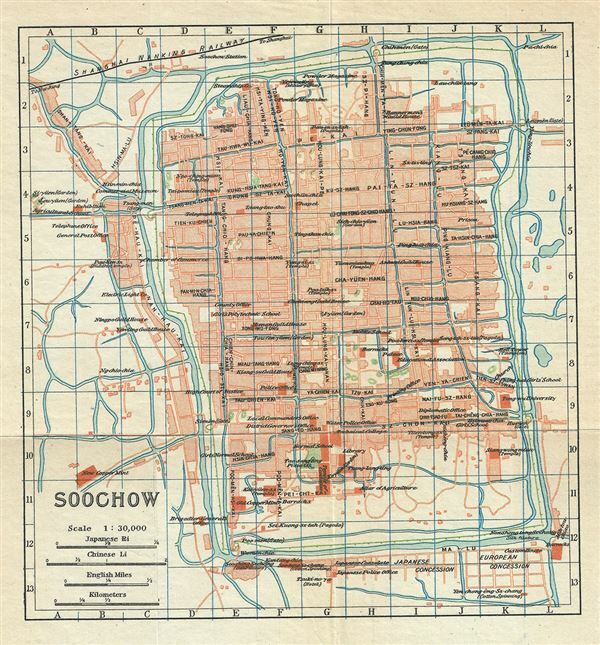 This is a beautiful 1924 map of Suzhou or Soochow or Suchow, part of the Yangtze River Delta region and located in the Jiangsu Province of China. The map was issued by the Imperial Japanese Government Railways. It depicts the city, one of the top tourist attractions in China, in great detail, noting streets, individual streets, rivers, railways and other topography. The classical gardens in Suzhou were added to the list of the UNESCO World Heritage Sites in 1997 and 2000. Suzhou is often dubbed the 'Venice of the East' or 'Venice of China.' This map was issued as part of the 1924 Official Series Vol. D of the Guide to China and printed at the Toppan Printing Company.